Born: 24 September 1894, Luckhoff, Free State, South Africa. Died: 17 December 1982, Pretoria, South Africa. Phillipus Jacobus Johannes Fourie, son of Lourens Hermanus Fourie (who was killed in the Anglo-Boer War in 1899) matriculated at Grey College, Bloemfontein, in 1912. He then joined the civil service as a clerk in the magistrate office in Vereeniging. Later he obtained his MRCVS in Dublin in 1919 as one of a group of students selected by the South African government for training in veterinary science abroad, before training facilities were established in South Africa. After his return to South Africa he served as Government Veterinary Officer at Grootfontein (1920-1921), Onderstepoort (1922-1923) and Vryburg (1924-1925), before settling at Onderstepoort as a lecturer in pharmacology. He also lectured in pathology, medicine and pathological physiology. One of his early papers dealt with "A case of demodectic mange in the goat" (South African Journal of Science, 1926, Vol. 23, pp. 760-764). In 1931 Fourie obtained the degree Dr.Med.Vet. at Utrecht, The Netherlands, with a thesis on The haematology and pathology of Haemonchosis in sheep. 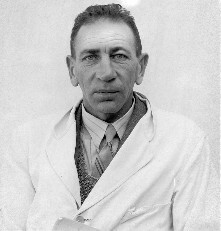 Later he became Professor in milk and meat hygiene at Onderstepoort, in which capacity he served until his retirement in 1960. He also served as Dean of the Veterinary Faculty for many years. He contributed to, and published on a wide range of veterinary problems, including pioneering studies on congenital porphyrinuria (pink tooth) in cattle. Fourie, Phillipus Jacobus Johannes. Vets past, at http://www.nda.agric.za/vetweb/History/Vets Past EF.htm as on 2016-12-5. Fourie, P.J.J., Rimington, C. & Roets, G.C.S. Quantitative studies upon porphyrin excretion in bovine congenital porphyrinuria. Onderstepoort Journal of Veterinary Science and Animal Industry, 1938, Vol. 10, pp. 421-430. South African Journal of Science, 1926, Vol. 23, paper by Fourie. University of the Cape of Good Hope. Calendar, 1913-1914. List of matriculants.